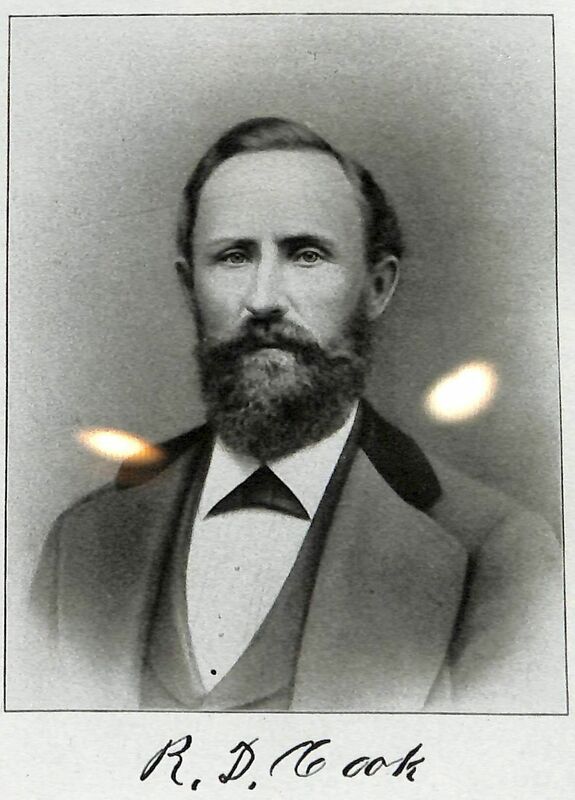 Rudolph Cook arrived in the Santa Maria Valley in 1869. 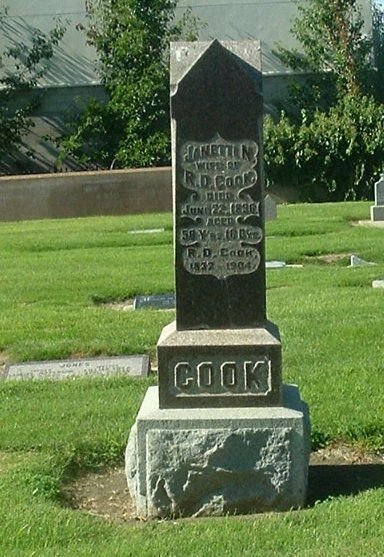 Headstone of Rudolph Cook, who died in January of 1904. Born in Franklin, Clermont County, Ohio on June 19, 1832, Rudolph Cook, one of 14 children, spent his boyhood days farming and learning the carpenter’s trade to help support his family. In 1851 at the age of 19, he left home and went to Quincy, Illinois, and then to Missouri before joining an immigrant train headed for California. According to the book, “This is Our Valley,” with 130 men, women and children in the party, the wagon train was larger than most, with 64 prairie schooners drawn by oxen. Four months later, the wagon train reached Hangtown and the gold fields, where the party split. Cook was one of those who went on to Sonoma, arriving there with 75 cents in his pocket, but with a heart full of optimism. Since he’d learned a bit about carpentry, he was soon hired as a boss carpenter by a Sonoma builder and, like most of the men who followed the gold rush, he was also looking for cheap land. In 1852, he was said to have put up the first threshing machine in the state and harvested the first crop of grain ever sown in California. Still, the man didn’t have his sights set on making records. He just wanted to make a living. In 1853, he was farming again and the following year he took up a claim near Santa Rosa, and set out 10 acres of fruit. On Oct. 12 in the same year, he married Jinnetta Nelson, whose family had also crossed the Plains. Since he wasn’t able to secure the stock he needed for his farm, he made a trip east in 1856, going by boat via Panama. In St. Louis, Missouri, he organized a party of nine men, including his brothers -- Larken, Lafayette and Othup -- to help him drive his herd of 350 head of cattle and 20 horses back over the trail he’d traveled five years before. All went well for the Cook family until the dry year of 1864 came along and he lost everything. Looking for a better location, he moved his family to Solano County. In the spring of 1869, the family joined a wagon train headed for Los Angeles, but stopped in San Luis Obispo when Rudolph heard about a tract of government land that was available for settlement in the Santa Maria Valley. He was so impressed with the valley that he decided to stay. Since there was no housing yet available in town, the Cook family stayed in the old adobe in Guadalupe. Meanwhile, he and his brother, Larken, began building a two-story house at what later became Main and McClelland streets, hauling lumber from Port Harford, nearly 30 miles away. The house, the first permanent residence in Santa Maria, was ready for occupancy early that fall, but before the family moved in, the Cooks gave a party and dance, historically to raise money for the valley’s first school, the Pleasant Valley School, which opened in February of 1870. By farming, doing carpentry work and doing some hauling, Cook managed to hammer out a good living until 1874, when in the month of February, the present town site was laid out. He then started a blacksmith site on property that later became the site of the Hart House, and still later, The Bradley Hotel. He later built Cook Stables and became a very successful businessman. Cook was a member of the notorious vigilante group that helped to clean the town of its undesirables and was among those who ran the notorious Tambo out of town. Jinnetta, his wife, died in 1896 and Rudolph died in January of 1904. Services were conducted at his residence with the Odd Fellows in charge of the ceremony. Just as the funeral procession was about to reach the cemetery, the skies opened up with a heavy downpour.